Capricorn 2019 Horoscope... Fresh Forecast Taking You From November 2018 to December 2019! 2019 spells surrender for Capricorn, with the potential for transformation. Powerful shifts are on the cards; your personal transition commences before Christmas, and you may want to hit the escape button between November 8th and December 31st in favour of some major R&R. Travel could offer the fresh perspective you’re seeking. January 5th is your true New Year ushering in a fresh start, with a new moon in your sign emphasizing your responsible side – particularly in relationships and in relation to friends and your community. January 21st is a reminder that you’ve worked through trust and intimacy issues, and you can now lean into partnerships, with sweet spots for you in February including Valentine’s Day. A new chapter begins for love, romance and even making a baby on March 6th. Your unions are due to take on even greater significance, as you continue to see how much better life can be when you’re open to a tender exchange. Taking a step back to focus on you could be challenging with so much activity around your personal relations. Progress feels more challenging in the summer months, ideally suited to self-reflection and working with others, however August 30th is one special date to broaden your scope, and is ideal for travel. September 28th to mid-October is perhaps the most important window of the year. Despite a heightened mood, this could be the time you’re truly able to embrace the shifts being asked of you. Look forward to a new adventure in December, when the planet of prosperity enters Capricorn. Growth planet Jupiter is entering your closure zone in November, Capricorn, spelling surrender and the end of an era. This is the area that governs spirituality and your dream-life, and you may be inclined to travel to get the answers you crave, and the healing you need. It’s also the zone of transitions, and it could be time to give something up, quitting bad habits and beginning to let go of all that no longer serves you! It could also indicate a year of increased solitude, secrets or working behind the scenes, preparing for a very special quest beginning at year-end – December 2019. See important dates during Jupiter in Sagittarius, here. This is a longer-term influence that’s inviting you to buckle down, work hard and go the distance, Capricorn, and also the emphasis of January’s partial eclipse in Capricorn on January 5th. With wise owl Saturn now in your sign it’s time to show the world your true colors – a firm and resolute charcoal gray and classic coat of French navy. Saturn is your ruling planet, so hopefully you’ve been faring well in 2018 with this heavy planet trudging on through your sign. You’ll continue to step up, as the planet of boundaries, limitations and responsibility makes his way through your first house of personal approaches and appearances. Note you might loose weight over the coming years; Saturn promises structure and discipline around your personal style, and it’ll be easier to stick to a regime. Get straight on your personal goals early in 2019 with the new moon in Capricorn, and upgrade your wardrobe to reflect your upcoming ambitions. You have until 2020 to make an incredibly powerful impression, with stoic Saturn and powerful Pluto in the most immediately personal area of your horoscope. Think: maturity, quality, prestige and authenticity. This year is all about stepping into your personal power, gaining a sense of personal responsibility, and calls for an investment in empowering pieces that show you’re claiming your new responsibilities. March sees Uranus move permanently into earthy Taurus for a seven-year stint, which can shake up your love life, Capricorn. Over the coming years you’ll experience varying degrees of excitement and unrest around your sense of passion and creativity; what you put out in the world can be radical, surprising and different! Perhaps you’ll make a baby using IVF, surrogate or new technology (like Sagittarius rising Kim Kardashian did during the previous Uranus in Aries cycle). Perhaps you’ll publish an online book or write for a digital platform. You might find love through an app or dating website, or find new ways to have fun or hobbies that are different to the norm. Expect a different approach to your connection to the things you love. Read more about Uranus in Taurus here. Venus In Capricorn – Venus trekking through your sign between February 4th and March 1st 2019 signals your best days to feel confident and attractive. New Moon in Capricorn (Solar Eclipse) – January 5th 2019. Second New Moon in Capricorn (another Solar Eclipse) – December 25th 2019. Mars In Virgo – August 18th 2019 to October 3rd. 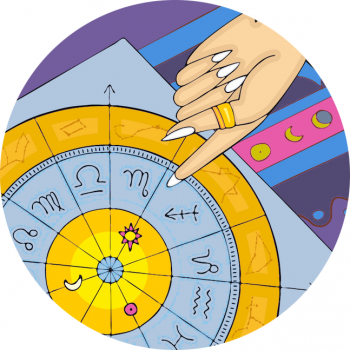 Double your pleasure by reading your horoscope according to your rising sign, too. Your monthly horoscope is here!